Aging in place would be so much easier if you had a live-in companion to assist you, answer your questions, give you needed reminders, and entertain you. Meet Alexa – Alexa is the voice personality found in the Amazon Echo line of electronic assistant models, which include the largest original Echo, the compact Echo Dot, the video screen version Echo Show, and the compact video version Echo Spot. Once you get it set up, the Amazon Echo Dot has tons of useful and fun features that are easy for anyone to use. While new technology can be a bit confusing and hard to learn, the Echo Dot makes it fairly simple. At a low cost, you can effortlessly listen to your favorite music, get information on the weather, add items to your shopping list, and much more. Some older folks are hesitant to try new technologies that are too complicated and confusing. But using Alexa is easy. Simply say, “Alexa,” followed by your question, request, or command. For example, you can say, “Alexa, what time is it?” Alexa will activate when it hears its name, then answer your question. There aren’t many radio stations that play music for the greatest generation. But you can listen to whatever music you want to hear on your Echo, by simply asking for it. There’s no need to fuss with CD’s, song lists, remote controls, stereos, or radio nobs. You can ask Alexa to play a specific song, or an assortment of music from your favorite artist, or a whole genre such as Swing or Jazz. For seniors who love to read, it can be very disheartening when they begin to lose their eyesight It can become more difficult to see the small text in a book or remember where you left off. Your Echo device can read audiobooks out loud to you. You can continue to enjoy your favorite authors and stories without straining your eyes. You just listen. And with the Amazon library, your book options are limitless. Do you need to refer to a recipe but have your hands full in the kitchen? Alexa and read the recipe to you. It can be confusing and frustrating for anyone at any age (particularly seniors) to try and manage an assortment of electronic devices. But the good news is, the Echo can connect to all of them, giving you just one device to control the rest. If these other devices in your home are appropriately designed or adapted, the can adjust your smart thermostat, turn smart lighting on and off, start your Roomba vacuum cleaner, and even control your smart TV. Simply ask Alexa to do it all. As we age, our memory can start to fade, and it can become harder and harder to remember dates, times, numbers, and names. With your Echo device, you can set daily reminders for all sorts of things. Medications - You could simply say, “Alexa, remind me to take my pills at 8 pm.” When the time rolls around, Alexa will verbally remind you. Ask Alexa anything under the sun, no matter whether it’s important or as trivial as a crossword puzzle clue. What questions would you like to ask? Alexa will give you the answers. Nothing could be easier. Trying to remember where you left your shopping list notepad, looking for a working pen, and writing with arthritic fingers can be a challenge. Create a shopping list with Alexa instead and ask her to add items when you see they are running low. Later, you can ask Alexa to read you the list, or you can view it in the Amazon Alexa app on your smartphone. Are you baking a recipe and need to convert ounces to cups? Do your need to add, subtract, or multiply a series of numbers? Your Echo Dot can be connected to a family member’s Echo Dot. This can be a useful feature for a senior who lives alone. With a simple voice command, you can send an alert to designated contacts in case of an emergency. In addition, you can send messages or make calls between Echo devices. 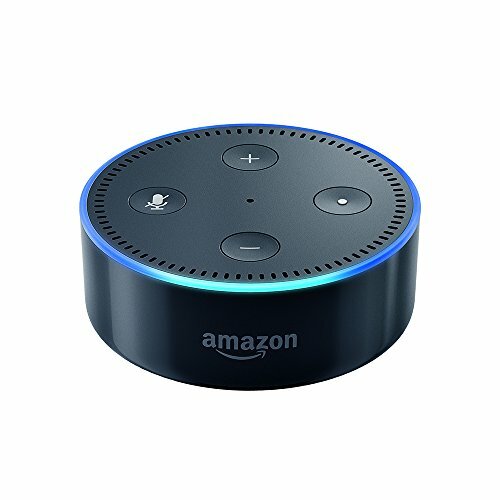 The Echo Dot is ranked by Best Buy as their number one best-selling electronic assistant. At 3.3 inches in diameter and only 1.3 inches in height the Echo Dot is small enough to fit anywhere in any room. At half the price of the full-size Echo, the Echo Dot is so inexpensive, you could afford to buy more than one for multiple rooms in your home. The Echo Dot contains more than 50,000 skills and offers all the easy to use functions found in the full-size Echo. While the 1.6-inch speaker in the Echo Dot will not fill a room, it can deliver quality sound to a listener close by in their bed or favorite chair. And seniors who need to hear a stronger volume and serious music aficionados always have the option to connect the Echo Dot to bona fide stereo speakers, using a cable or Bluetooth. We noticed that the Echo loudness can vary, depending on whether Alexa is answering a question, reading a book, or playing music. The Echo Dot offers all the easy to use tasks available in the full size Echo in a more compact case at half the price. The essential difference is the size and number of speakers. In the same way that a walker can aid a senior’s mobility, an electronic assistant can aid a senior’s brain. With the Alexa conversational voice features, the Echo Dot serves as a virtual companion to help a senior live an easier, independent, and fully functional life as they age in place at home. While much of technology can be difficult to understand, the Echo Dot is different. After all, what could be simpler than speaking a command? Look through the customer reviews posted on the Amazon and Best Buy websites and you will find testimonials on how the Echo Dot has changed the lives of their parents or grandparents. Alexa could be the best roommate a senior could ask for.